As the name suggests itself, Blackmail is all about blackmails. 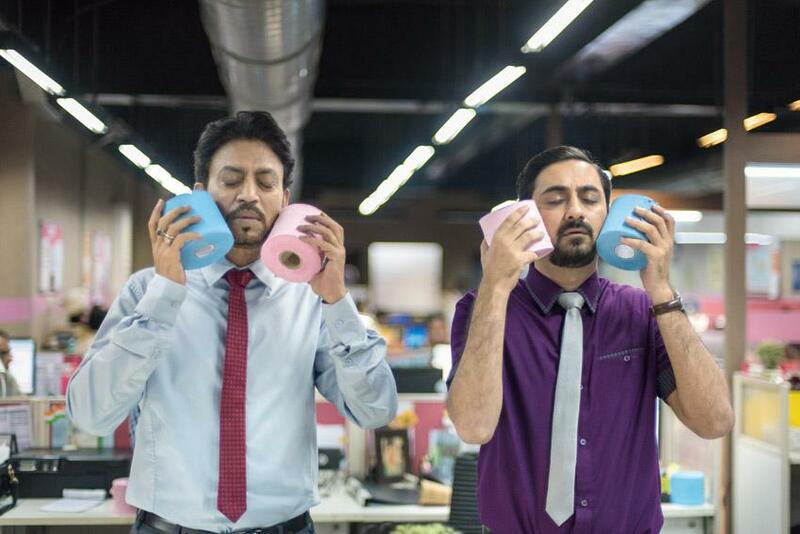 Dev Kaushal (Irrfan Khan) is a middle-aged, middle-class man who works in a private company run by DK (Omi Vaidya). Everything is hunky-dory in his world until, on an unfortunate evening, he returns home early and finds his wife Reena (Kirti Kulhari) with another man Ranjit (Arunoday Singh). Instead of confronting his wife and her lover, he decides to blackmail Ranjit and a vicious cycle of blackmailing starts. Will Ranjit and Reena ever find out the blackmailer? How long Dev be able to guard the secret? Watch the film to know more. It is indeed a hard job to find an actor who gets into the skin of his character as effortlessly as Irrfan Khan does. Last year, he won our hearts with splendid performances in films like Hindi Medium and Qarib Qarib Singlle, and now he surprises us yet again with an outstanding act in Blackmail. Is there any role which this actor cannot do? Perhaps, no! You fall for his character in Blackmail as soon as it appears on the screen. The actor nails it with his terrific acting calibre. Talking about the female lead, Kirti Kulhari is perfectly cast in her role. Her character is not that layered but she does full justice to everything that she does in the film. Arunoday Singh is the surprise package of the film. His act is thoroughly enjoyable. Supporting cast of the film is excellent, especially Divya Dutta who plays Arunoday Singh's wife. Director Abhinay Deo is not new to the genre of black comedy. He aced it with the release of his directorial debut Delhi Belly in 2011 only. His latest directorial, too, has ample doses of black comedy. He blends his directorial skills with the story written by Parveez Sheikh and Pradhuman Singh Mall and offers a film that is well-made and enjoyable. He makes most of the talent that he has in the form of Irrfan Khan. Not just Khan, he takes best out of every actor that you see in his movie. Blackmail is a well-intentioned film made with a lot of sincerity. The film promises to be an entertainer and does not disappoint you. The cinematography of the movie is good. Editing is also crisp. Background score is in perfect sync with what plays out on the screen. Production design is praiseworthy. The Blackmail album takes off on a good note with songs like “Happy Happy” and “Patola”. However, if truth is to be told, there is nothing exceptional in the album. A lot was expected from Amit Trivedi’s composition “Bewafa Beauty”, but the song does not rise above being an average number despite the sensational Urmila Matondkar at the centre of the attention. Amitabh Bhattacharya’s lyrics do not create the magic he is known for. Blackmail is an unmissable film for a host of reasons. It has Irrfan Khan who is at his terrific best. Kirti Kulhari delivers a very unconventional performance which is thoroughly enjoyable. Arunoday Singh is endearing throughout the film. In addition, the movie has some genuinely funny dialogues and a taught screenplay which does not allow distraction. Blackmail offers you this beautiful whole combination and much more than that. Now, it depends on you whether or not you want to watch the film.